What do cats like? Sleeping, fish, pretending to like humans and then scratching us… Plenty of things. But there’s one thing we didn’t know they liked until we saw this video clip here… Street musicians! Or at least this one singer-songwriter, at least. He’s playing on the streets of Malaysia and not really drawing much of a crowd. It’s a quiet day out, not many people around. Here’s about to call it quits for the night and go home when he begins to draw an audience… A little gang of stray kittens! And they really seem to love the guy’s tunes! Who’d have thought it, huh? 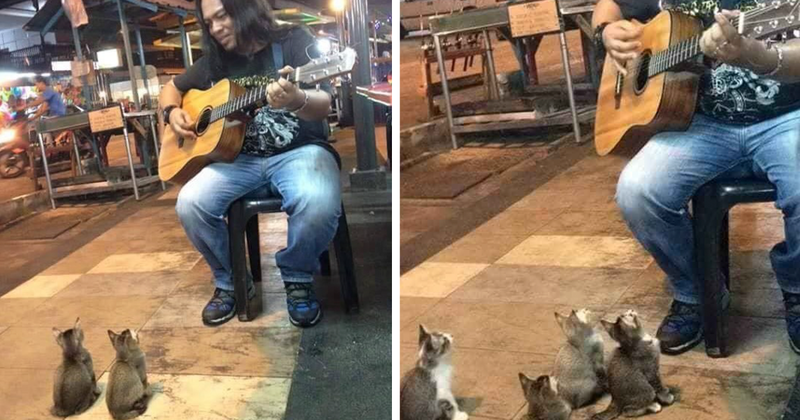 The guy plays nice and it’s a charming song, but we didn’t realize that felines were so keen on the guitar. This video has gone super viral since hitting the net a few months ago. Millions have people have been charmed by this little clips and now you’re about to be too! Previous articleShe Didn’t Know What Her Gynecologist Would Find… OMG! Next articleAlaskan Fisherman Feeds A Big Flock Of Bald Eagles… But When The Camera Pans Left? WHOA!